Squirrel Nut Zippers The Squirrel Nut Zippers began their musical journey in Chapel Hill, North Carolina in the mid-1990s. Between 1995 and 2000 the Squirrel Nut Zippers sold over three million albums. Their watershed album, Hot was recorded with the heated influence of New Orleans, fueled by a smoldering mix of libations and a youthful hunger to unlock the secrets of old world jazz. The band has mixed genres of Kelzmer, Blues, Americana and random bits of contemporary music to create their signature style. Audiences are sure to enjoy this band’s outlandish antics as the make a joyful racket at this year’s Heights Summerfest. Be sure to update your eardrums with their twelve new original songs on their Beasts of Burgundy album, releasing March 23rd of this year. This show will be set to impress with a dance floor, reserved tables ( limited number) General Admission seating. Tables are rounds of 6- you may purchase tickets for reserved tables please note there will be other at the table unless you purchase the entire table. When you purchase a table of 6 we donate $10 to a local non profit. No food or drink is included in the table tickets. 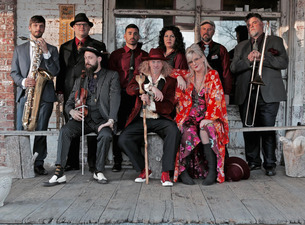 The Squirrel Nut Zippers began their musical journey in Chapel Hill, North Carolina in the mid-1990s. Between 1995 and 2000 the Squirrel Nut Zippers sold over three million albums. Their watershed album, Hot was recorded with the heated influence of New Orleans, fueled by a smoldering mix of libations and a youthful hunger to unlock the secrets of old world jazz. The band has mixed genres of Kelzmer, Blues, Americana and random bits of contemporary music to create their signature style. Audiences are sure to enjoy this band’s outlandish antics as the make a joyful racket at this year’s Heights Summerfest. Be sure to update your eardrums with their twelve new original songs on their Beasts of Burgundy album, releasing March 23rd of this year.